Anne Lund joined the Core Faculty of the Nutritional Sciences Program (NSP), Department of Epidemiology in 2009. She is the Director of the Graduate Coordinated Program in Dietetics, which is accredited by the Accreditation Council for Education in Nutrition and Dietetics (ACEND) of the Academy of Nutrition and Dietetics. Under her supervision, 14 graduate students a year complete the training to become Registered Dietitian Nutritionists (RDN). In 2015 she was awarded the Outstanding Dietetics Educator Award by the Academy’s Nutrition and Dietetic Educators and Preceptors group. Anne also coordinates practicum and fieldwork rotations for MPH-Nutrition students. 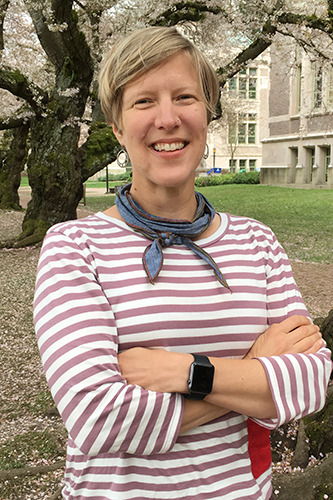 Before joining the NSP faculty, Anne was a research coordinator for 5 years at the UW Center for Public Health Nutrition where her work focused on school wellness policies and screen time reduction efforts. Anne served as a Peace Corps Volunteer in Nepal and completed her dietetic training at the University of Wisconsin- Madison. Anne was the Washington State Academy of Nutrition and Dietetics 2017 Outstanding Dietitian of the Year. Anne Lund's research interests are in the areas of obesity prevention through school wellness policies, physical activity promotion and screen time reduction, and the relationship between school environments and student intake. Anne leads the MPH practicum (NUTR 595), the MPH fieldwork (NUTR 532) and three sections of the Dietetic Practice Experience (NUTR 561). She also teaches Introduction to Dietetics (NUTR 561a). She previously taught Nutrition Education (NUTR 536).